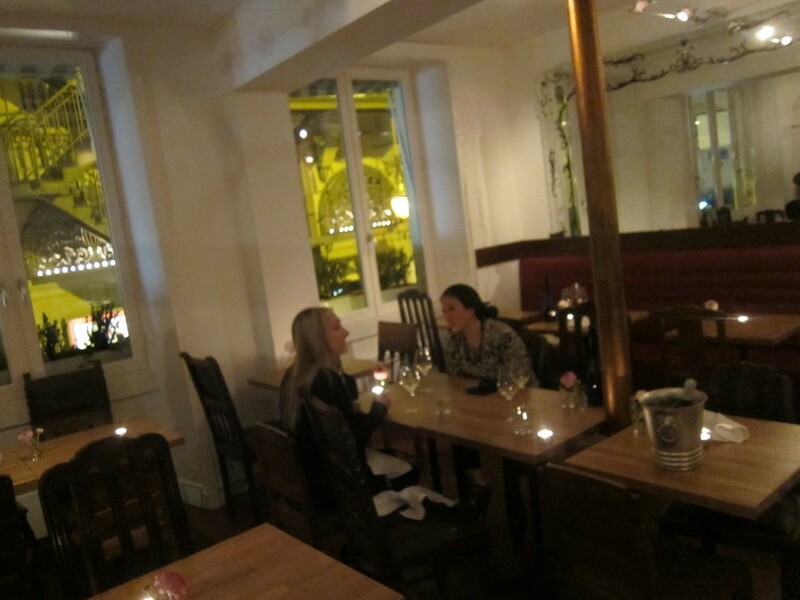 The restaurant is in a darling space — just off the edge of rue de Montpensier, slightly hidden in a corner that you get to through a narrow passageway off the street. And it’s certainly a larger, more ambitious endeavor than Hidden Kitchen was. 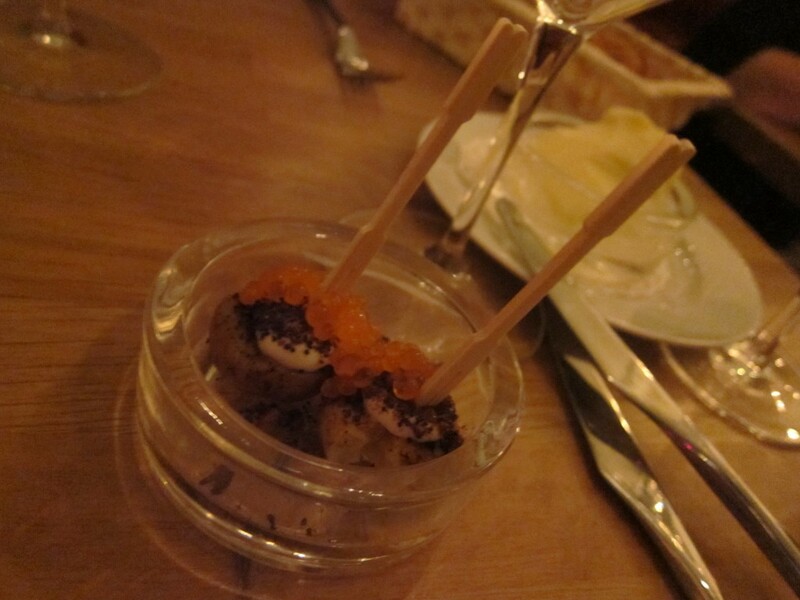 Our meal began with a bang — an amuse bouche of a little potato topped with creme fraiche and roe. The combination of flavors and textures in this little bite was intense — I immediately wanted another after inhaling mine. The chefs here pride themselves in cooking with the freshest ingredients available — Paris locavore from nearby farms. 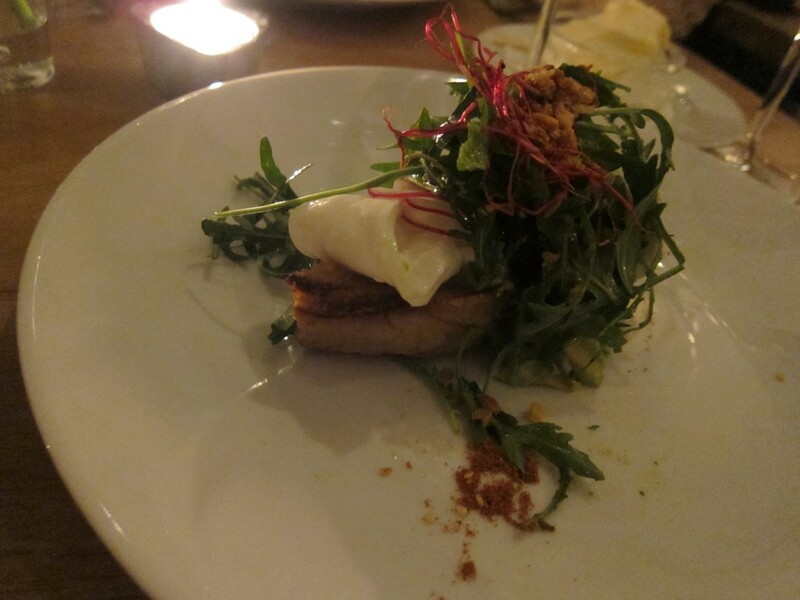 This was evident in our first course: grilled sourdough with soy-candied brussel sprouts, radishes, arugula, avocado and burrata. Fresh greens aren’t usually the thing I gush about — but if this was the kind of salad I was getting all the time, I’d certainly be doing more gushing. 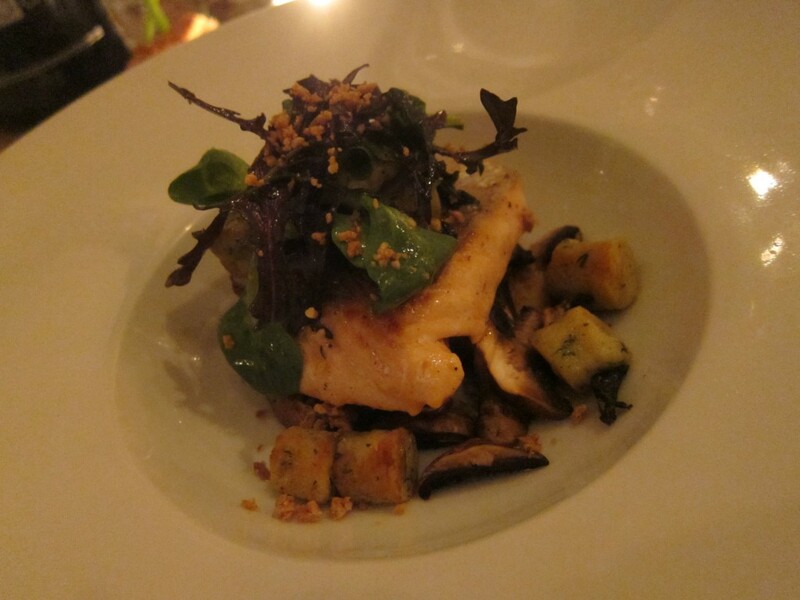 Next up, we had a skillet trout with mushrooms, picholine olives, ricotta dumplings and verjus jelly. (Verjus, by the way, is the tart juice of unripe wine grapes.) The fish was terrific but I have to confess the little chewy dumplings, with their slightly salty kick, were my favorite item on the plate. 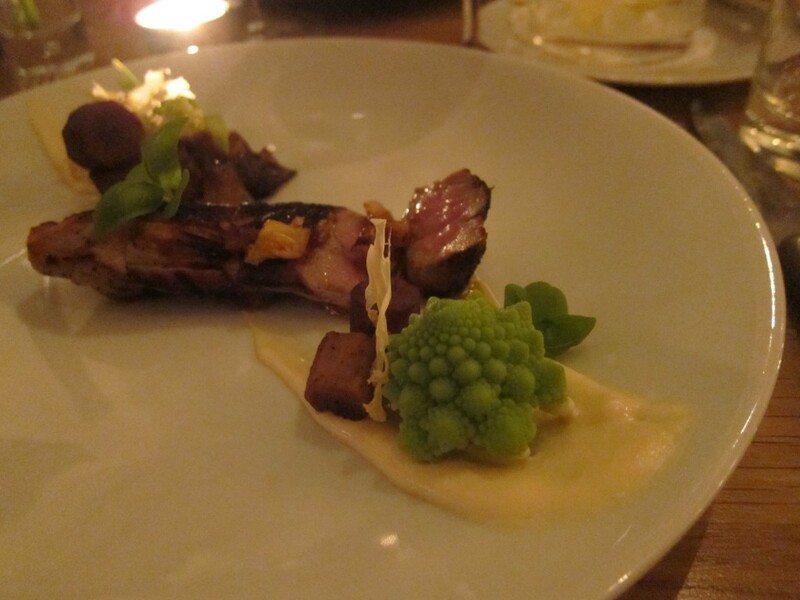 Our final savory course sounded promising — grilled milk-fed veal with miso labne, pickled cauliflower and nori crumbs — but ended up being slightly disappointing. The veal was tougher than I expected — and not quite as flavorful as I’d hoped. 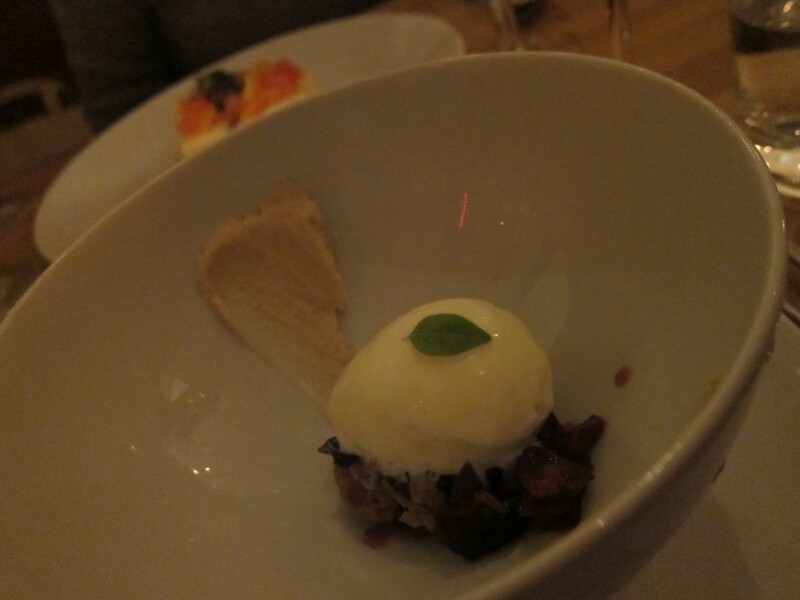 But the accompaniments made up for it a little — the cauliflower offered a nice tartness. We decided to sample both desserts, the first of which was an American lunchbox classic: An oatmeal cookie. I have to admit to feeling a little silly about eating an oatmeal cookie in Paris — I bake these all the time at home and, in fact, am incredibly picky about them. I almost never buy or order them anywhere in New York simply because I like the ones I make (sometimes with six spices or more) better than any others that I try. Perhaps this was the problem here. Although the cookie was dressed up with tasty accoutrements (milk sorbet, bourbon raisins, hazelnut butter, roasted grapes), I was disappointed with how bland the cookie itself was. 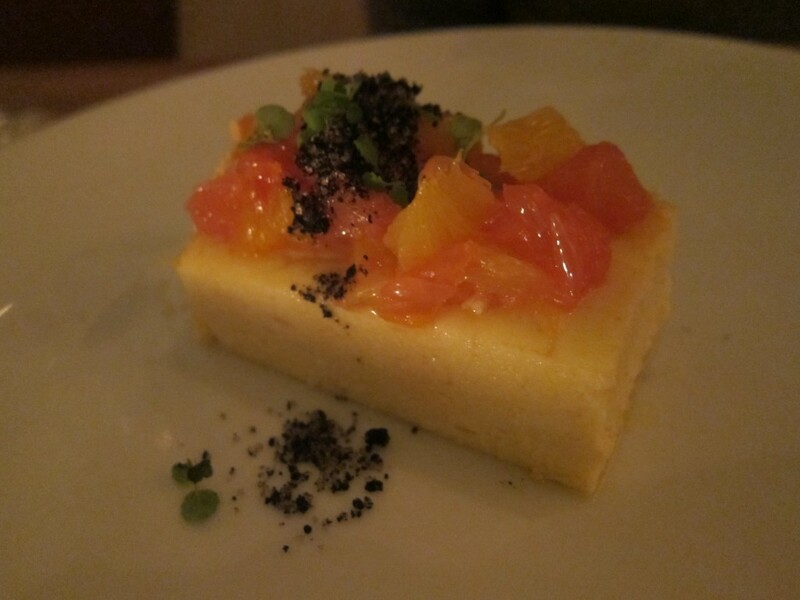 We had better hopes for the buffalo milk ricotta cake topped with grapefruit, blood orange, bergamot and tonka bean-poached kumquat. It looked beautiful on the plate and didn’t taste bad — but the cake itself was very dense and heavy and the texture was rather mealy. 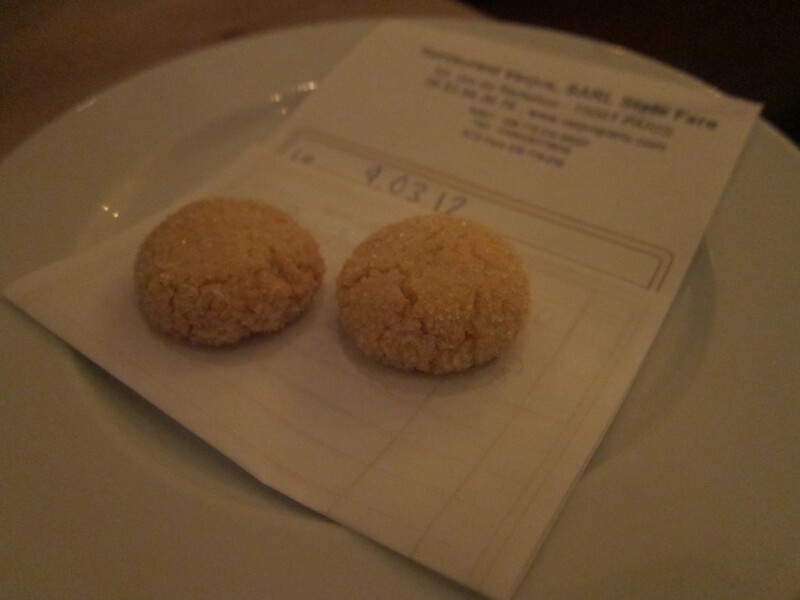 The little sugar cookies we got to close out the meal left us with a sweet note, however. In the end, it didn’t entirely matter how the food was — our dinner was packed with one essential ingredient: delicious conversation. 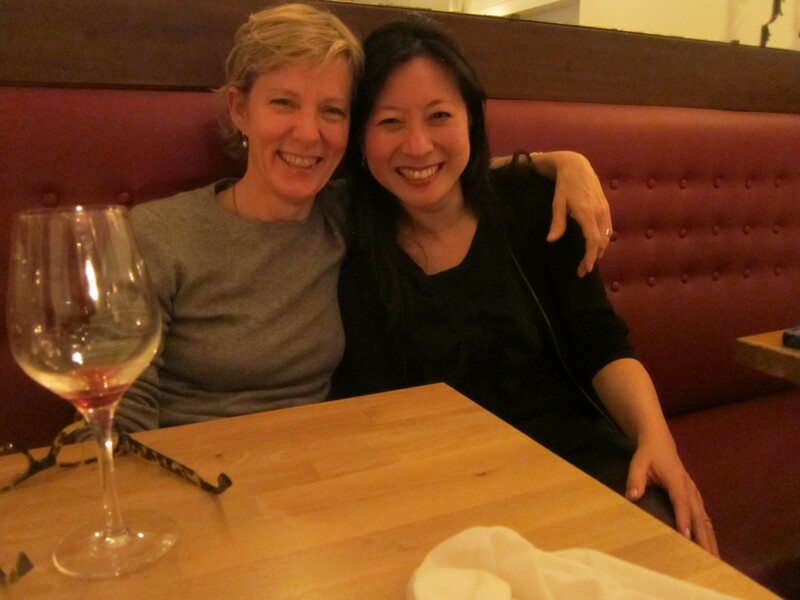 And after so many months of cooking together, it was nice just to be able to share a big hug. 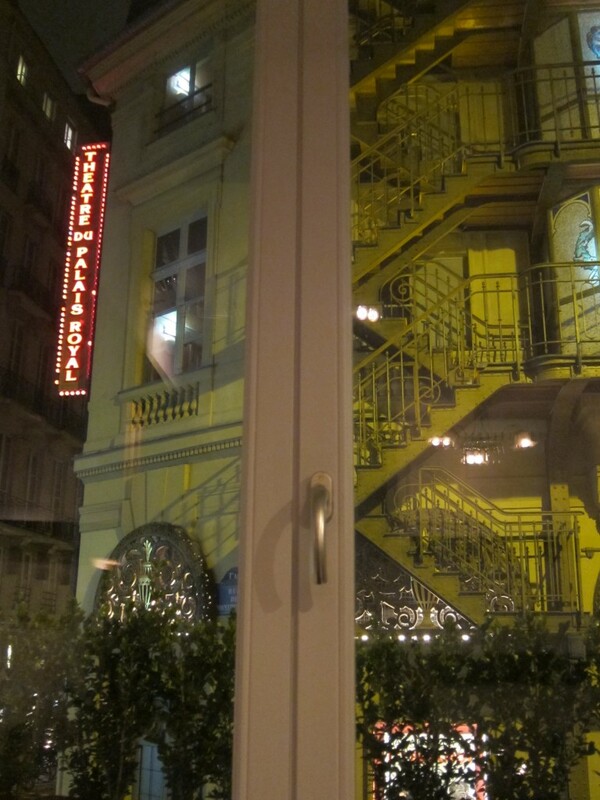 This entry was posted in American, France, Let's Lunch, Paris, Restaurants, Tales From the Road and tagged American, Hidden Kitchen, Let's Lunch, Palais Royal, Paris, Verjus by Cheryl. Bookmark the permalink.